Interviewing a nanny is a tough job. You have so much invested into hiring the right person that a normally stressful task becomes even more intimidating. While there’s not one formula that works for every family, here are some red flags to watch out for as you interview potential caregivers. She’s late. If the nanny is late, there’s a small chance that something completely unexpected happened, like a natural disaster or her car breaking down. However, it’s more likely something that she should have predicted is to blame. Weather, traffic, accidents and most other things are all instances she should have considered when she was figuring out how long it would take for her to get to your house. If she’s unable to predict things that can go wrong for something as important as the interview, that’s not a good sign about how she’ll handle other unexpected situations. She doesn’t have a clear idea of the type of activities to do with kids in your child’s age group. It’s one thing to have age specific experience listed on a resume and a completely different thing to be able to comfortably talk about what that age needs and enjoys. If she doesn’t have a working knowledge of the age she’ll be caring for, chances are your child won’t get what she needs. She doesn’t ask you any real questions. The success of the employment relationship depends on a good two way match. The candidate should ask questions that show she’s really thought about her needs and preferences. If she doesn’t, she’s not effectively screening for the right family match, which will surface later on as problems in the employment relationship occur. She’s more interested in the pay and benefits than in you. The compensation package you’re offering is an important consideration for any candidate. However it shouldn’t be her top priority. She should be more focused on what you need, on the type of family you are and on what you’re looking for in your next nanny. She doesn’t answer situational questions in a way that makes you comfortable. Your interview should always include ‘what would you do if” questions. This gives you a chance to see how a nanny would react in different situations. If her answers lack common sense or don’t take important factors into consideration, you’re not going to have a lot of confidence that she can successfully handle the responsibility of keeping your child safe and happy. She doesn’t have a personality that you connect with. The nanny may be a great caregiver and a wonderful person, but if your personalities don’t mesh well, it won’t be a successful match. It’s hard to reject a nanny that’s the right fit in so many other ways, but remember you have to work with her day after day. Is she the kind of person you’re going to enjoy having a long term relationship with? She’s overly anxious to just get the job. When a nanny wants a job badly, even when it doesn’t really match what she’s looking for, there’s usually some other motivation behind her anxiousness. You want the person you hire to be happy in the job long term. A nanny who’s looking for a quick job fix usually ends up moving on sooner rather than later and the employment relationship is filled with problems from the very beginning. She avoids questions about her past employers. Even if a nanny left a job on bad terms, she should be willing to talk with you about her past employers. It may be uncomfortable for her, but she still should be forthcoming about what happened. If a nanny dismisses or glosses over past problems, that’s a clue that there might be a much more serious problem there. It’s definitely something you want to follow up on before you make a hiring decision. She gives you contradicting information. When a nanny says one thing, then 30 minutes later says something completely contradictory, there’s something amiss. Either she truly doesn’t know her own mind or she’s trying to mislead you. Either way, it’s a sign that what you’re hearing in the interview doesn’t really reflect what she thinks or the way she’d act on the job. She doesn’t engage with your child. Of course she’s there to talk with you, but her days will be spent with your child. If she doesn’t take an active interest in your child or doesn’t try to engage him, it could mean that’s something she struggles with. Since that’s the core of a nanny’s job, it’s a piece of the puzzle you want to pay close attention to. Sometimes it’s hard to tell during an interview with a family if they’re the right family for you. The decision to work with a particular family or not is influenced by lots of different factors that are specific to what you’re looking for and what feels right to you. 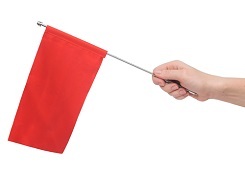 But there are some red flags that almost always indicate the job isn’t one you should take. Here’s a quick peek at what to be on the lookout for. The parents can’t provide you with a clear job description. Before you can decide if a job is right for you or not, you have to know what the job entails. When the parents are unable to provide you with a detailed and well thought out job description, it’s impossible for you to make an educated choice. Your personality doesn’t mesh with the parents’ personalities. Sometimes a job is great in every other way, but you just don’t connect on a personal level with the parents. That’s reason enough to pass on the job completely. Remember, you have to work with the mom and dad day after day. Personality counts. They have a parenting philosophy you don’t agree with. You and the parents don’t have to be mirror images of each other, but it is important that you’re on the same page when it comes to handling discipline and other kid related situations. If you don’t agree with how they’re raising their kids, it will be impossible for you to support them and be successful in the position. They won’t talk about their previous nannies. You don’t want parents to talk disrespectfully about past nannies, but you do want them to be willing to discuss what didn’t work. If they’re unwilling to share those insights with you, there’s a good chance it will be a problem that will carry over into your employment relationship. The household isn’t one you’d be comfortable working in. The family’s home is also your work environment, so it’s something to check out during the interview to make sure you’re a match. If you’re a neat nick and the house is a mess, it could be a hard place for you to work. If you need to have everything put away to feel relaxed and at ease and the family has things strewn all around, chances are the house will be a constant source of stress for you. They have a different idea of what a typical day should look like. Make sure you talk about their expectations for the daily environment you’ll create for their child. If you’re a nanny who loves getting outside, even in the heat of summer or the cold of winter, are they comfortable with that? If you love going to the park, the zoo and the local play space, are they going to allow that? If your vision of a great day is different than the parents’ vision, it’s not the job for you. Their employer style isn’t one you work well with. Every parent has her own style and her own way of managing her nanny. Is the parent you’re interviewing with a micromanager? Does she want regular check-ins with the nanny during the day? Does she think you only need to sit down and have a family meeting if there’s a huge problem? Make sure your style and the parents’ style align. They have unrealistic expectations. Even if you’re an absolutely amazing nanny, there’s only so much you can do. Make sure that the parents recognize the boundaries that come with the job and also your limitations. Even if you want to take it all on and are super nanny, it’s simply not possible. They aren’t paying a competitive wage for what they want. The family may be paying a good wage for your area, but does the wage match the job description? Are they paying for nanny care, but asking for nanny care plus household management and some housekeeping? If you’re not going to be paid fairly for your time, efforts and talent, it’s not the right job for you. You can’t successfully meet the needs of the child. Sometimes all the other factors fall into place, but you just can’t meet the needs of the child. He may have special needs that you simply don’t have the training or experience to effectively deal with. Or he may have a temperament that you have a hard time coping with. When this happens it doesn’t mean he’s a bad child or you’re a bad nanny, it just means it’s not a good fit. It’s never too early to foster a love of reading in your children. One of the most wonderful resources at your disposal when it comes to getting kids to read is located right in your neighborhood: your local library. When the mercury rises and classes end for the school year, these are ten of the reasons why you might want to start spending more time at your local library. You Want Your Kids to Love Books – Whether you’re a bookworm or not, there are few places in the world more suited to stimulating a love of reading and books than the library. Turning your little one loose in the children’s stacks or directing your middle schooler to the Young Adult section is a great way to help them experience the wonder and excitement of a good book. Story Hour! – Almost all libraries, from the grandest to the smallest village branch, will offer some sort of weekly or daily story hour for kids. These events are a great introduction to books for pre-readers, and can help to keep a love of stories flowing in kids that are honing their reading skills. Community Programs – You may not realize it, but there’s more to your local library than books and films. Many act as a sort of community hub by allowing postings for community events and by hosting relevant programs for kids and adults alike. You’re Financially Strapped – Raising kids is anything but cheap, which is why so many parents appreciate the programs in local libraries. Most are free or extremely low cost, and can help you to keep your kids occupied and learning throughout the summer without forcing you to pay day camp fees. Peace and Quiet – If there’s one thing that hasn’t changed with time, it’s that the library is a place where shouting and loud speech is frowned upon. When you’re raising children, peace and quiet is a very rare and precious commodity. At your local library, you’ll be able to soak it in for a while. Finding Rare and Out-of-Print Books – Introducing your children to a favorite book from your own childhood is a rewarding experience, but it’s not always easy when those books are relatively obscure or out of print. Rather than scouring online merchants to find a used copy of questionable quality at an outrageous price, check with your local library! If they don’t have a copy on hand, they may be able to locate one for you from another branch. Supporting a Fixture of Your Community – As eReaders and eBooks continue to become more popular, many local library branches are struggling to remain relevant. Because they are analog establishments in an increasingly digital world, libraries today need all of the support they can get. Socially-conscious parents that want to support an integral part of their communities can make a real difference in the life of a library simply by visiting. Age-Appropriate Entertainment – When you have kids that span a wide range of ages, finding entertainment that’s appropriate for the little ones without boring the older children can be a real challenge. Because your local library will have a variety of sections and caters to a wide range of interests, you’ll be able to keep everyone in the family happy with one trip. Fostering a Sense of Independence in Kids – Finding, checking out and accepting responsibility for their own books from the library helps kids take small but necessary steps on the road to independence. Beating the Summer Heat – As temperatures soar, finding affordable means of entertainment that will allow you to beat the heat often becomes a top priority. The air conditioned library will keep everyone cool while providing worthwhile, intellectually sound entertainment. Look for bulletin boards at your local library to inform yourself of upcoming events, or inquire with the library staff about newsletters and email lists. You may be surprised when you realize just how many exciting things there are to do at your local branch! Time outs are a common and accepted form of punishment today for parents and caregivers alike. As far as forms of punishment go, there are many compelling reasons to give your child a time out instead of resulting to other physical forms of punishment. Taking a time out can help your child calm down and be able to make better choices; however, the “time-out” is often overused and misused by parents. Time-outs are not always the answer. Most misbehavior a child exhibits are a sign of a bigger emotional problem. If your child throws a temper-tantrum because he cannot play with the green car, there is a good chance his temper-tantrum is about much more than the car. In order to discover what else could be bothering him, you need to sit and spend some time with him. When you instantly send him out of the room away from you for getting upset, it does not help him to fix his problem. In fact it usually makes his problem much worse. Give your child a “time-in” instead. Sending your child away from you will only work to make the underlying issue worse. Instead, have him sit next to you for a certain period of time. This will serve two purposes. First, it will help him to calm down and think more clearly, which is the ultimate goal of a “time-out.” Second, it will reassure him that he will not be left alone to figure out how to act. Third, it will give you a chance to discover what might be the underlying issue he is struggling with. When possible, you should sit with your child during this time, but if you are unable to do that, having him in the same room to you or at the seat next to you can make a big difference. Let the “time-in” be over when the child is ready. Parents often set timers or select an appropriate time for the child to be punished. Unfortunately, this often does not help him learn to ultimately control his behaviors. Setting a time implies that at the end of the time, he should be acting “right,” but if there is an underlying issue at play, this will likely not be the case. Instead, give your child the power to control when he is ready to re-enter play time. Tell him that when he is ready to act, talk and play in a helpful or kind manner, he can return to his toys. This gives your child the choice. Perhaps he really needs some time away from other children or simply is craving some time next to you. By giving him the control over when his time-in is over, you empower him to make his own choices. Give yourself a time-out. When your day has been long, you are exhausted and your child behaves in a less than desirable manner, it can be very difficult to remain calm. This is when frustration and yelling occurs most often in the home. Instead of sending your child away because you are frustrated, try walking away from the situation yourself. Taking an adult time-out can help your child more than you might realize. It models an appropriate way to handle anger and frustration. It helps you to regain your composure so you can better address the issues your child is facing and it helps you to react to your child in the way you want to. Though there certainly are times that it is in the child’s best interest to be sent into a time-out, most of the time the best discipline for a child is more time with you. That is most likely what your child’s underlying need is to begin with. As parents, you are inherently busy. There are a lot of details that go into raising children, not to mention the upkeep of a home and any other outside responsibilities you take on. Add to that work outside the home and there may be days that you do not stop working, from sun-up to sun-down and beyond. Here are a few tricks to help you find a few extra moments in your day. Pay attention to how much time you spend on your computer in entertaining activities. If you spend the majority of your time with your kids and not around other adults, websites like Facebook and Pinterest can be great ways to connect with others, as well as be a great way to get a little “you” time. Be careful though, because it’s easy to quickly lose track of time on these sites. Set a certain time everyday that you will check-in and check-out with the social media world, then set a timer. This will help ensure that you don’t lose track of time and get sucked into the time warp that can be created. Don’t neglect time with your kids. This is often the quickest thing to be taken off the list, but it really is the most important thing to make sure stays on the list. Individual time with your children is critical to their emotional development. Just 15 minutes of your undivided attention each day can make a world of difference. Parents often reason that the extra time that is saved is needed “just today,” but in reality neglecting this time with your child will cost you in the end. When children get individual attention from a parent or caregiver they are less likely to act out with negative behaviors. When you have children who act out less, you will find more time in your day. Spend one hour at the beginning of the week planning out your week. 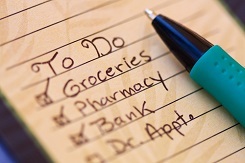 Sunday night is a great time to gather your to-do lists and activity calendars for the week and plan your agenda. Certainly unexpected events are bound to come up, but when you start your week off with a plan of action, you are better able to address the emergency issues that inevitably arise. By spending an hour at the beginning of the week planning your week you will be more likely to be on the same page with your parenting partner too, as it will give you the opportunity to coordinate schedules and expectations. Divide larger jobs into smaller parts on your to-do list. Big jobs or tasks can seem overwhelming at first glance, but when you separate out the big jobs into smaller section they can seem much more manageable. You can tackle one small task at a time, choosing to do part of it during naptime and part of it the next day. The whole thing does not need to be accomplished all at once. Divide to-dos into three categories. By labeling things into duties taking under 15 minutes, duties taking under 30 minutes and duties taking over 30 minutes you can better assess how to approach tackling them. That way when you are planning your week or when you suddenly find yourself with a little extra time on your hands, you can look at your to-do list and quickly find a task that can be done in the amount of time you have. Don’t forget to take time to relax. You may be able to run on all cylinders for a period of time, but eventually your energy level will drop. Don’t feel guilty about taking time to rest and rejuvenate. If this means that you take a nap with your kids every once in a while or go to bed early, do it. If it means that you find a way to go out with friends now and then, make it happen. Sometimes you will have to pull yourself away from the children and family you love so that you are able to be the best caregiver for them you can. Caring for children is a non-stop job. Many parents that stay home and care for their kids also have other jobs and responsibilities. It can be hard to find time to do everything, but it is possible to get things done with children around. Whether it’s a casual remark tossed aside by a childcare provider or an earnest discussion with a teacher or coach, there’s nothing quite as painful as hearing negative feedback regarding your child’s intellect, developmental pace or abilities. Everyone wants to believe that their child is Mary-Poppins “practically perfect in every way,” but that’s simply not the case. Children, just like adults, have their own individual strengths and weaknesses. Before you allow a poor evaluation to upset you and spoil your attitude, it’s wise to look for a course of action that will be both productive and reassuring. When you hear a teacher or childcare provider openly discuss a weakness that you know your child possesses, your natural instinct may be to cling to denial. It’s important to remember, though, that denying a problem exists will not make it go away. The first step to proactive and productive problem management is to accept the news you know is true, even if it’s something you don’t want to hear. After all, how will you begin to go about correcting an issue if you refuse to acknowledge it out of pride and fear? The news that your child has not reached developmentally appropriate milestones for her age, that she may be exhibiting signs of a learning difference or that there are signs of a burgeoning behavioral problem is never easy to hear. Rather than tuning out when the negative words are spoken, force yourself to listen carefully to the assessment you’re receiving. You won’t be able to provide your child with the help that she needs if you’re too upset or afraid to listen closely, ask the appropriate questions and engage in a dialog with the professionals providing the evaluation. You also don’t want to jump to conclusions, falling under the misapprehension that the situation is far worse than it actually is, simply because you stopped listening when the conversation took a turn for the negative. You may learn that your child is struggling with her reading skills, or that he has a behavioral disorder that will make it difficult for him to thrive in a traditional environment. 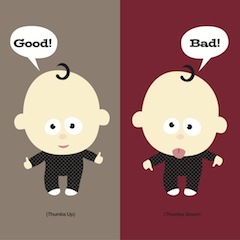 Rather than latching on to the negative aspects of a poor evaluation, try the old trick of looking on the bright side. Do what you can to mitigate the effects of a poor evaluation on you and your child by celebrating her strengths. Focusing on more positive aspects of an evaluation doesn’t mean that you’re ignoring the negative issues at hand, only that you’re keeping her positive progress in perspective, too. All too often, parents faced with a negative progress report or a poor evaluation of their child’s abilities will be so entrenched in their avoidance of the issue that they resist finding professional help. In the long run, the only person that’s being harmed by this avoidance is your child. If educators or medical professionals advise consultation with a specialist, don’t allow your pride to stand in the way of your child getting the help she needs. Work with those educators and medical professionals to determine what she needs in order to thrive to the best of her abilities, rather than sweeping the issue under the rug or trying to deal with it alone. When you’re faced with the news that your child is not progressing at the same pace of his peers or that there are indicators of a developmental delay, it’s important to understand that this negative assessment is not necessarily a reflection of your abilities as a parent. If you’re actively working with your child and are providing a safe environment in which she can learn and play, you’re doing a great job as a parent. Realizing that a poor evaluation is not a personal affront to you, your parenting abilities or the parenting style you’ve chosen is essential. When you blame yourself for things that are absolutely not your fault, you’re only wasting energy that could be more productively applied in the area of helping your child to flourish in her own way. Rather than blaming yourself, your spouse or your environment, spend time looking for the most effective ways of boosting your child’s abilities.